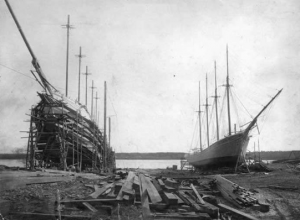 Named for the son of the owner of the Palmer Fleet of Boston, the five-masted schooner Davis Palmer struck Finn’s Ledge, just west of The Graves, in a terrible gale on the day after Christmas, 1909. The 305-foot wooden vessel, just four years old, was carrying a cargo of West Virginia coal into Boston. After striking the ledge, the Davis Palmer drifted into Broad Sound and sank. All 14 members of the crew perished. The schooner was built at the Percy & Small Shipyard in Bath, Maine, in 1905, under the supervision of Master Shipbuilder Myles M. Merry. 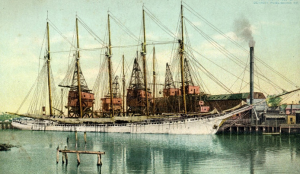 Ship owner William F. Palmer was a Boston man, a naval architect and entrepreneur who built 14 colossal five-masted schooners – all of which were lost. The Paul Palmer, a slightly smaller sister ship of the Davis Palmer, caught fire and sank on Stellwagen Bank in 1913. The wreck was discovered in 2000. 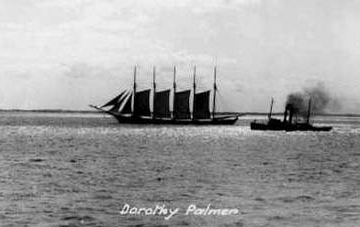 Another sister ship, the Dorothy Palmer, went down off Monomoy, Cape Cod, in 1923. The wreck of the Dorothy Palmer was discovered in 2010. Wreckhunter.net reports that the most of the wreckage of the Davis Palmer was removed during a Broad Sound Channel dredging operation in 1912. See more details about the Davis Palmer at Wrecksite.eu.